The neoconomy: a place without taxes, without a social safety net, where rich and poor live in different financial worlds  and it's coming to America. The first glimpses of the neoconomy appeared during the Reagan administration, but were soon clouded by a legacy of sky-high budget deficits. George H. W. Bush couldn't afford the neoconomy. In the Clinton years,its prospects all but disappeared in a flurry of economic fine-tuning that delivered record-setting budget surpluses and rock-bottom unemployment rates. But just when you might have counted it out, the neoconomy found a savior. George W.Bush was a businessman who understood the neoconomy almost instinctively, and had the will and boldness to make it a reality. 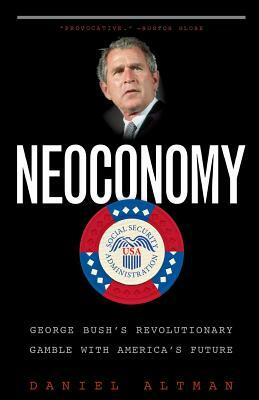 In Neoconomy Daniel Altman explains the intellectual roots of the Bush administration's economic policy; and why Bush has been so intent on implementing it despite the dashed expectations, terror and financial scandals that have buffeted the economy. He shows why the neoconomists remain committed to their vision even though it has contributed to the biggest budget deficit in history, at the end of the nation's fastest-ever swing into the red. The neconomists are seeking to transform the American economy; but inadvertently or not, they are also transforming American society. The revolution is finally coming,and it's coming from above. Daniel Altman is an economics columnist for the International Herald-Tribune, The New York Times, and Business 2.0 magazine. He received his doctorate at Harvard, where he taught undergraduates for three years. He now lives in New York.